Festival of Sound, or Festival of Indulgence as we had called it after it changed its name from ‘Indulgence’ after the last two shows, could be seen to have taken a bit of a risk with the name change. We thought it was quite a brave move as the indulgence brand had become established…would this rebrand alienate the show from the public? In a word, no. We took a flying visit to this show, arriving at the end of Friday to find the exhibitors happy with the quality of the visitors that day. There also seemed to be an overall agreement that the footfall was better than previous years. 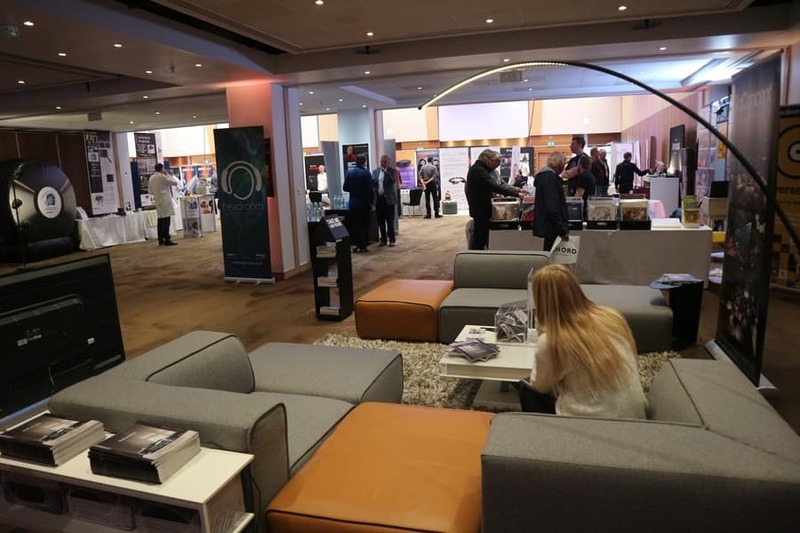 The UK Hifi Press was well represented with ourselves from Hifi Pig and journalists from the other media partners, The Ear and Hifi World in attendance. 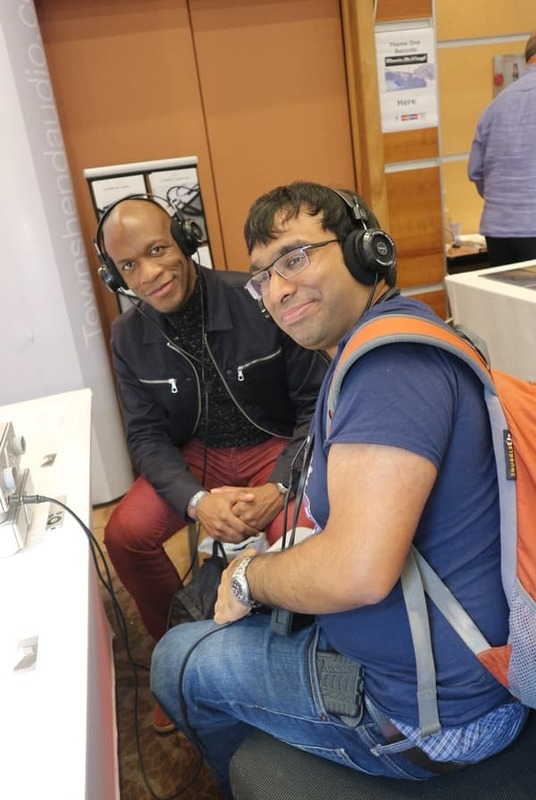 Also great to run into journos that we know from other big name publications like Hifi+, Hifi Choice and What Hifi….which shows that the show is now firmly on the map and deserves the full attention of the industry press. The Novotel is actually in a great location, all be it a little circuitous for us to get to from North West France (we are at the mercy of small regional airports and Ryanair). If arriving by tube it is just a hop and a skip to get from the Hammersmith station and around this area is full of pubs and restaurants. 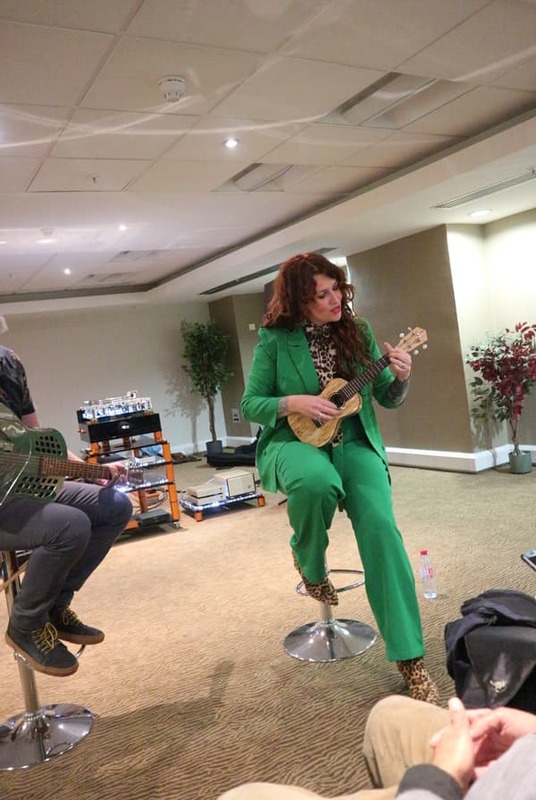 We found ourselves a fantastic vegetarian and vegan Indian restaurant for dinner and then returned to the Novotel to catch the last part of the evening’s entertainment from the Art of Noise’s Gary Langan and JJ Jeczalik. The atmosphere was great, just like walking into a proper venue with the lower ground floor of the show dedicated to live music and performances featuring a massive Bowers & Wilkins sound system, big stage and an excellent light show. The sound was superb, way above any ‘normal’ PA system and a great way to link the live music and Hifi themes of the show .I also think that doing away with the wines, gins, cars and other stalls that had occupied this area during the previous shows was an excellent idea. 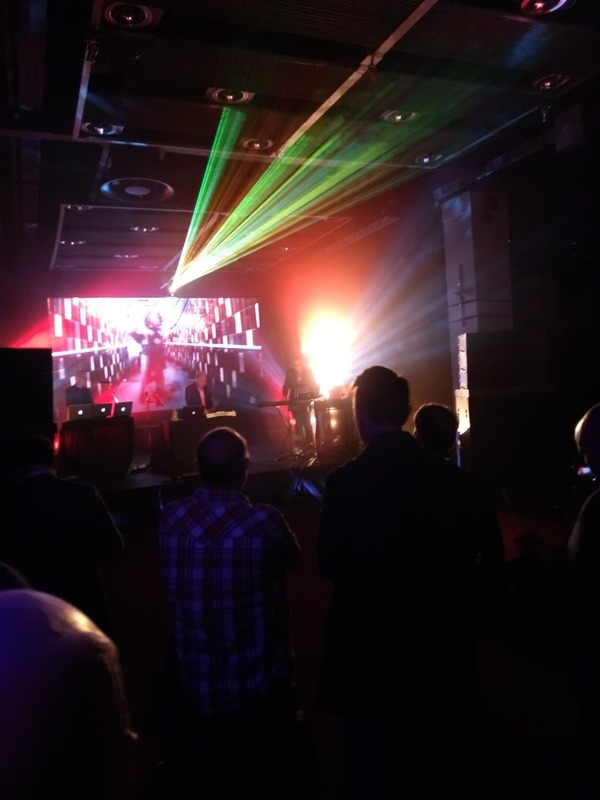 Having its own music venue really sets Festival of Sound apart from other Hifi shows and gives the punters (and the exhibitors) a different experience. The way UK Hifi shows have to go in order to survive is to have their own personal identity. Bristol is the ‘Traditional’ Hifi show, the North West Audio Show at Cranage Hall is the one in the most relaxed and comfortable surroundings with the ease of free entry and parking and Festival of Sound is the one that brings live music and Hifi together under one roof…for me these are the three to have on your UK ‘must visit’ list for next year. We heard feedback from other visitors that the live music venue was equally entertaining, featuring high quality acts, throughout the show. Fresh from a good night’s sleep and a fine breakfast Saturday for us was the time to take in the Hifi side of the show. The layout has now been condensed with three floors of actual Hifi rooms above the live music level. This made it much easier to navigate and gave an excellent overall experience with the rooms being one after the other. The rooms were all of high quality with plenty of big names bringing their best gear to delight the public. 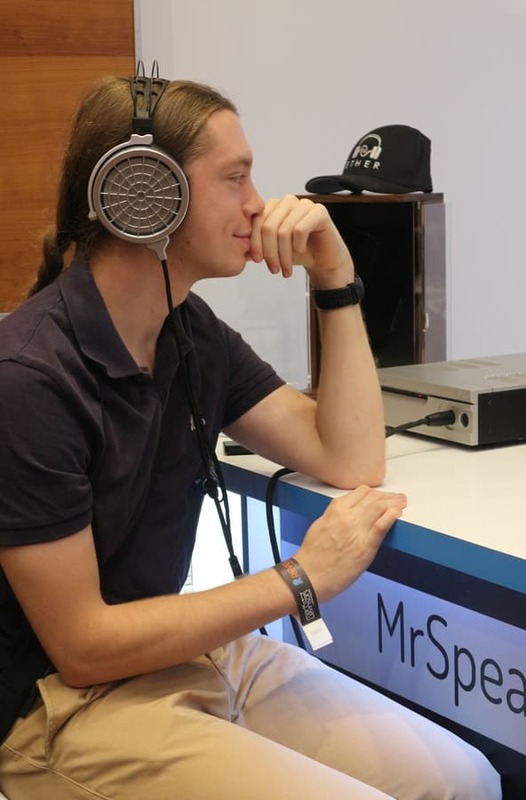 We visit a lot of Hifi shows, all over the world, so you do see the same brands several times a year. 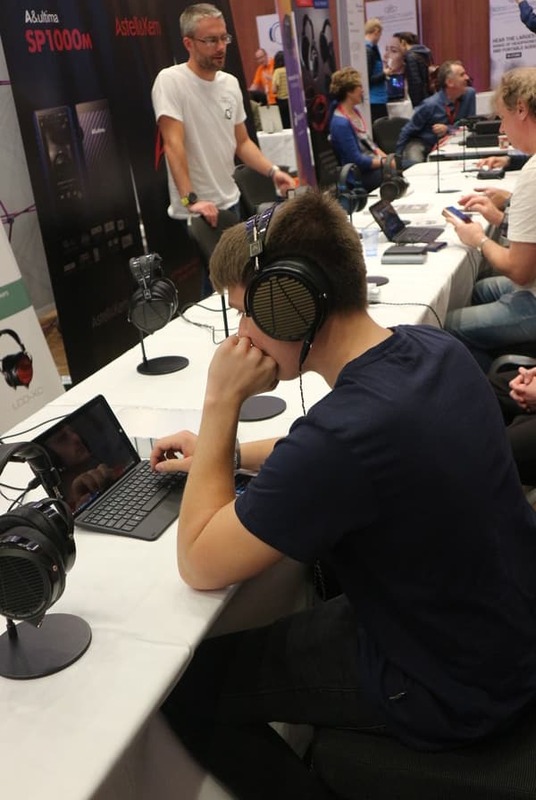 What is great is hearing different systems rather than the same thing again and again and the exhibitors achieved a freshness and pulled out all the stops to delight the public with their offerings. Stuart is bringing you coverage of the full show while I am picking out some of my personal favourites. This was quite tricky owing to the high quality, but I have managed to narrow it down. We applied our usual ‘top down’ method of covering a show and started on floor 2 which featured some nice, airy rooms of well known brands. 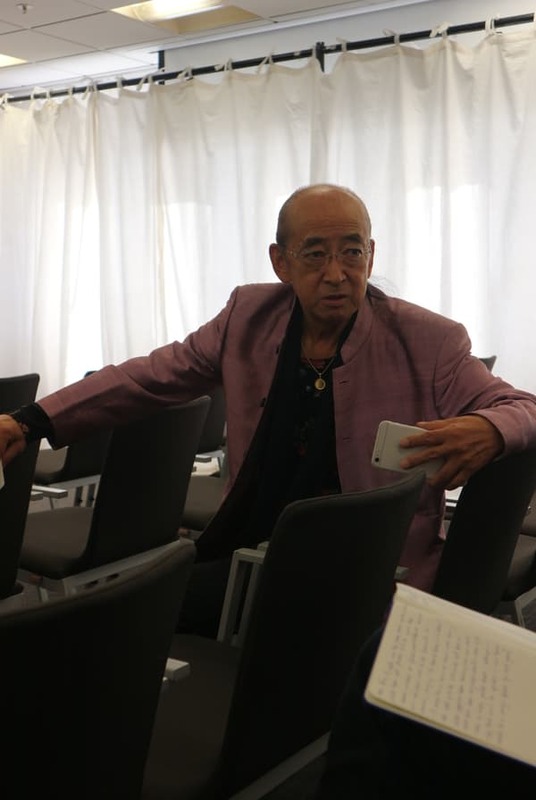 We kicked of in the Marantz room where we had a chat with the Hifi legend that is Ken Ishiwata himself. Bill Leigh of Auden Distribution really knows how to put a system together and partnered with Music Works to show a sublime combination of Accuphase (in a rose gold finish) with Amphion and Role Audio speakers. The Role Audio were playing when we were in the room and it was a great introduction to the brand. The sound was accurate but natural and we could have spent much longer in there. 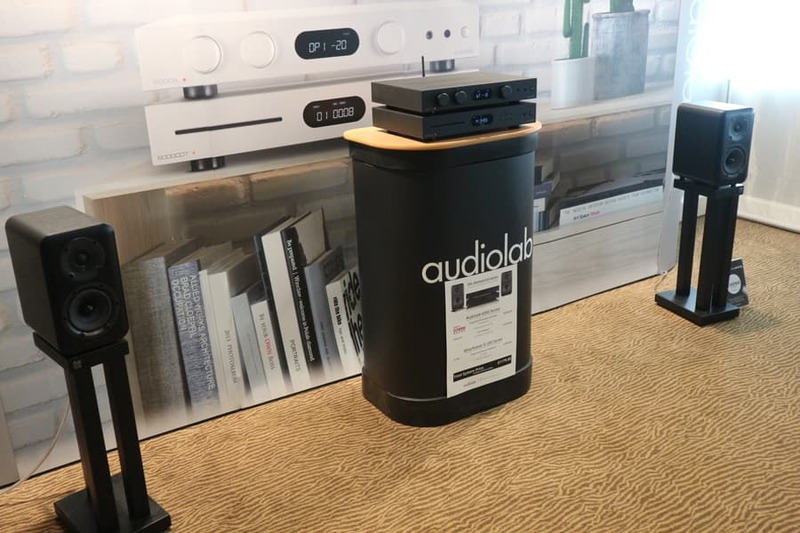 We brought you the news prior to the show of the new Audiolab 600 series of electronics. They have caused quite a stir for their combination of expensive looks and low price point, so we were excited about hearing them for ourselves. The Audiolab 600A integrated amp and the 600CDT CD transport looked even more high quality in the flesh. They were partnered with the (equally good looking) Wharfedale D320 standmount loudspeakers that cost just £199.95 (yes, you read that right!) 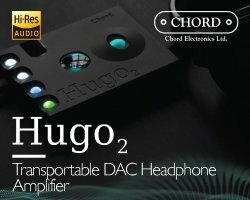 to bring in a sub £1200 system that sounded awesome. 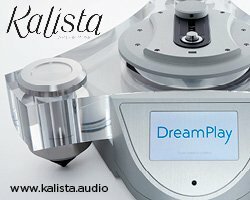 Honestly, for a balance of sound quality and price I think you would be hard pressed to find a better combination, plus it’s a great looking system that you would be proud to have on display at home. Well done to both brands…very much looking forward to getting these in for a proper review. 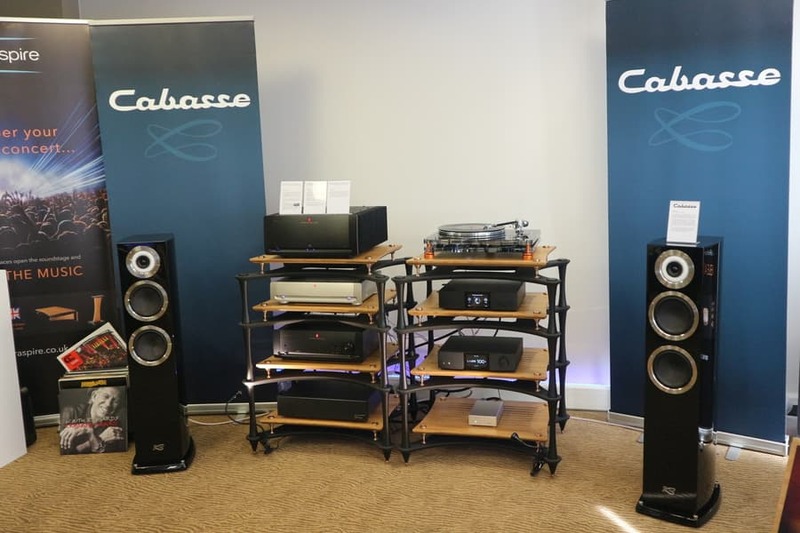 Cabasse, Heed and Parasound were to be found in the Connected Distribution room along with Auralic and Quadraspire. They were onto a winner as they were playing Daft Punk’s RAM when we were there and the sound was infectious to listen to, clean but with loads of energy. A great combination. We always say that it isn’t a proper show without plenty of Chord Electronics and Festival Of Sound did not disappoint. 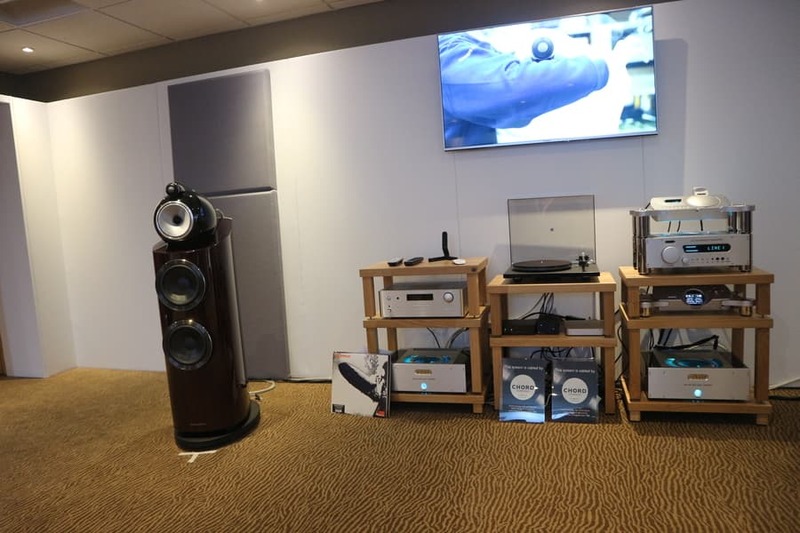 Moz and Tom from Chord were running their room featuring the new Hugo M Scaler and Etude amp, along with the DAVE DAC, partnered with some lovely Raidho standmounts. Chord show their electronics with a range of speaker brands and each system is well thought out and balanced. The sound was incredibly detailed and it was a chilled out room to be in. 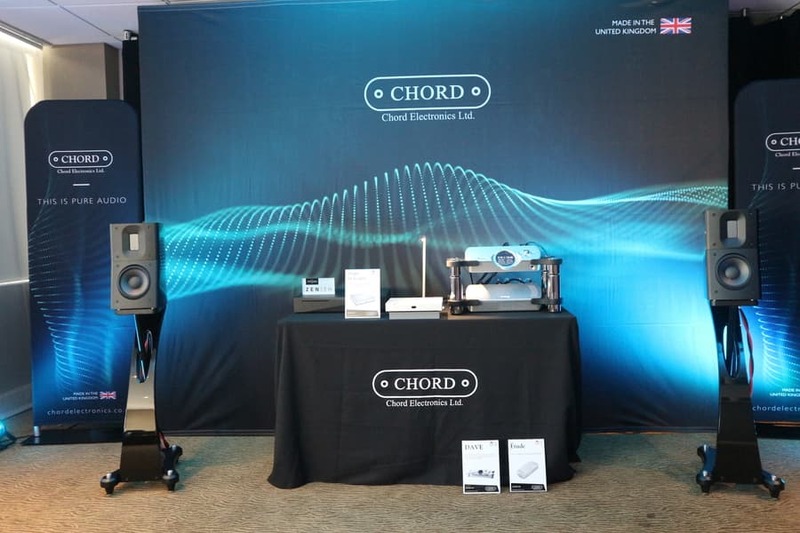 As you will read later, Chord had a heavy presence in many other rooms at the show which really showcased the versatility of their products. 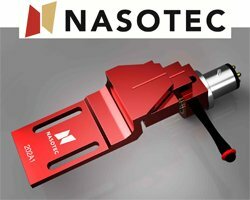 They are a brand that other brands rely on to give them a reliable, quality sound. 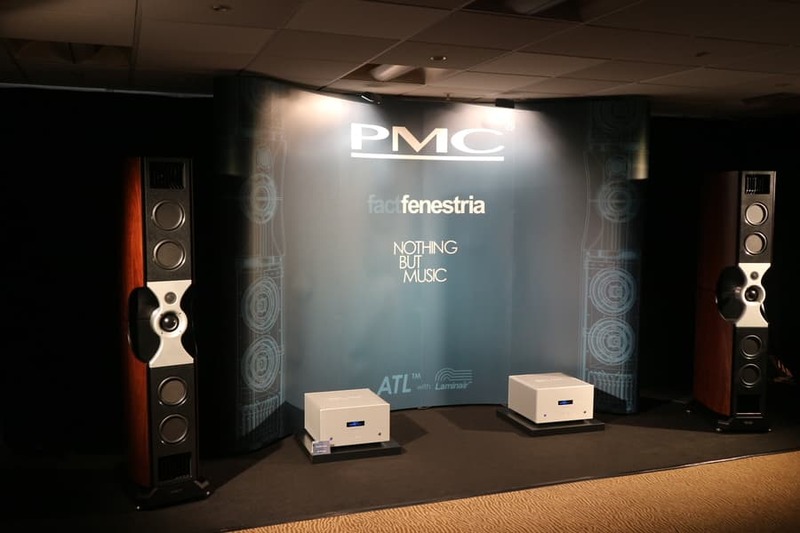 More big names next, PMC had two rooms, one featuring their Fact Fenestria flagship speakers that we first heard at High End Munich. 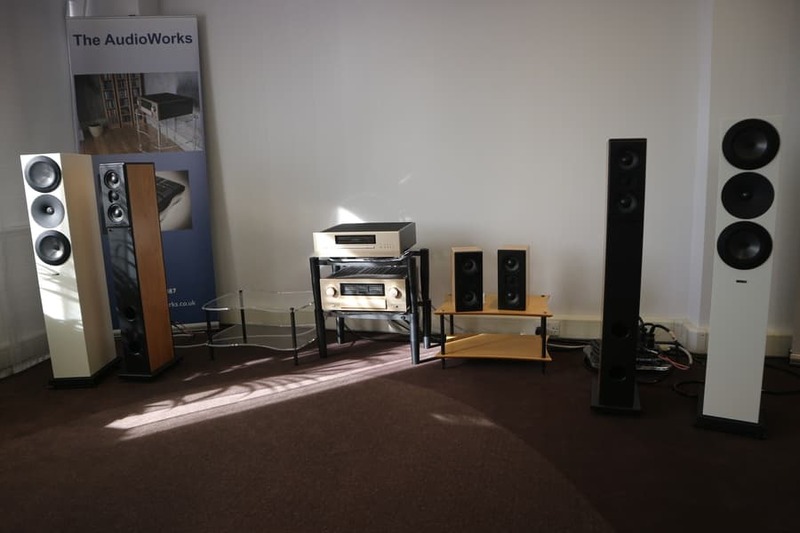 Partnered with a pair of big, German AVM monoblocks they sounded as good as we remembered…and at less than £50,000 they are not as eye-wateringly expensive as some high end speakers. 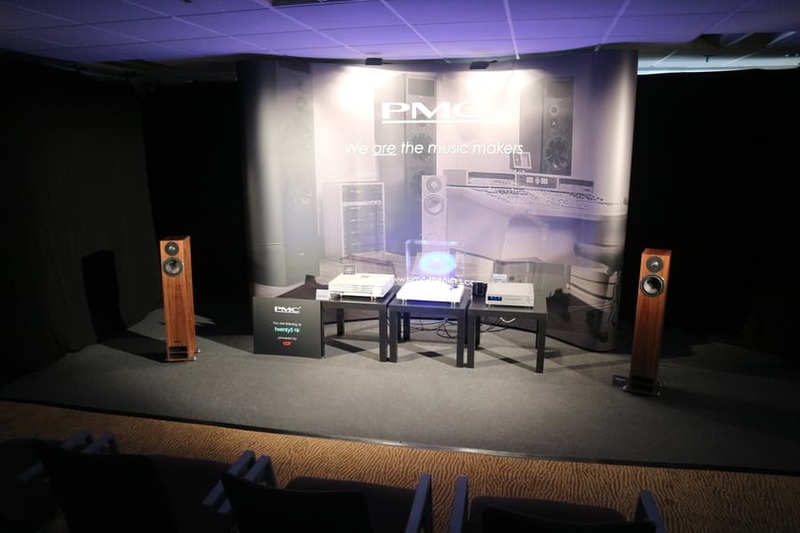 Their second room had PMC twenty5 23 loudspeakers running from their Cor amplifier and was just as impressive and showed the brand’s capabilities with more ‘real world’ products. One floor down was the big Champagne Terrace. 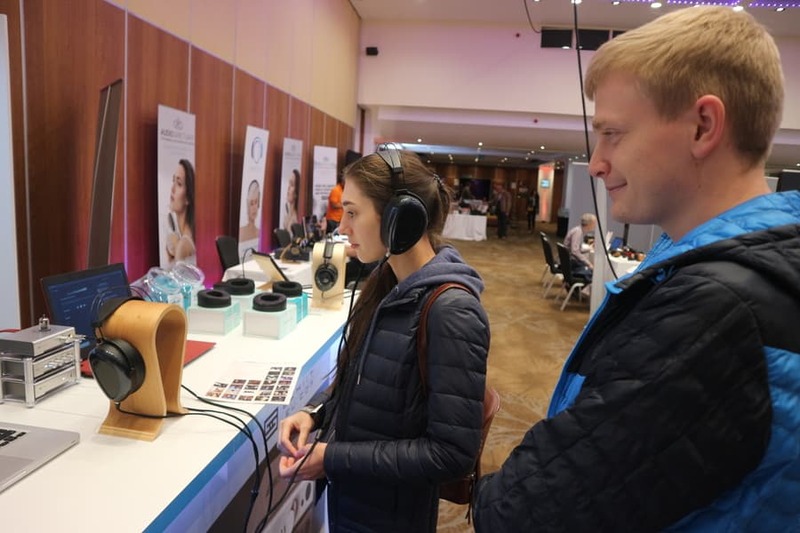 This featured a combination of the large Headroom area of static and headfi stands, it was great to see loads of young people and couples with a particular interest in trying the latest headphones and associated gear. There was a buzzy but relaxed vibe to this area with lots to catch the visitors eye and ear and smaller events going on throughout the show. There were also more rooms including Innuos, who were showcasing their now fully finished Zenith Statement Music Server. It now has its new, solid aluminium case and looks stunning. We heard the famous Statement vs Zenith SE test and it still sounds as good. 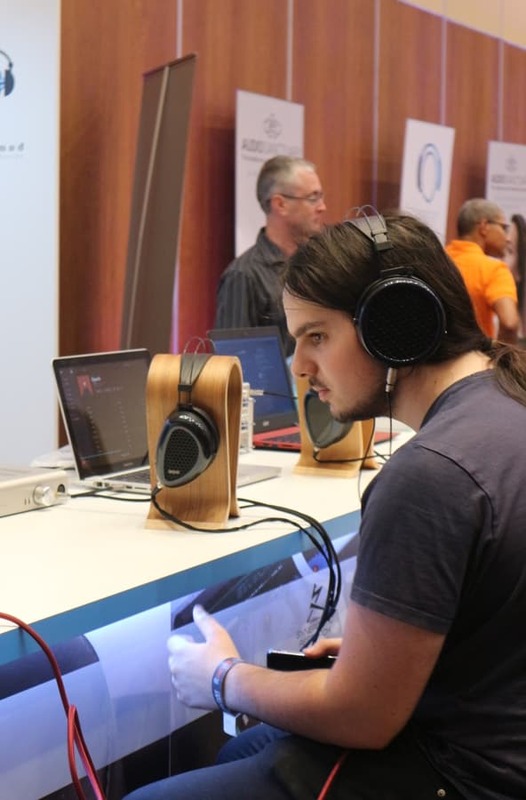 Innuos were using a full complement of Chord Electronics gear and KEF Reference floorstanders and had a fabulously clean and lively sound. 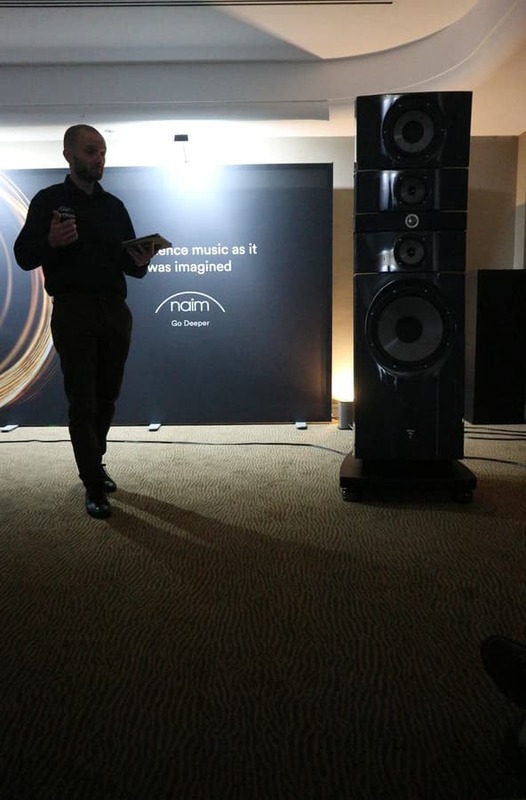 French brand Focal were showing their latest incarnation of the Grande Utopia speakers, the EVO 3 which come in at £160,000. When we heard these at Munich, where they launched this year, the hot, cramped, low ceiling listening cabin was less than sympathetic and did not allow their full potential. However, at Festival of Sound, in a much bigger room and now having had all their final tweaks, the new Grande Utopias were absolutely brilliant. Partnered with the massive Naim Statement amplification this really represented the pinnacle of the High End of Hifi. The sound was incredibly fast and accurate but also very engaging… another room I would have liked to linger in for longer. The room was packed and definitely wowed the crowds. We then moved onto the Mezzanine level which is one floor down and sponsored again, for the third year by Hifi Pig. 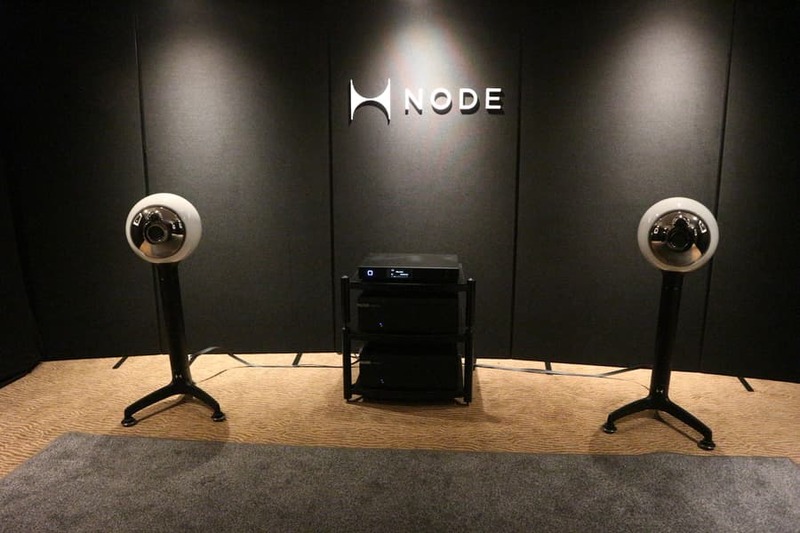 My standout rooms here included Node audio, we first heard their intriguing speakers at Cranage this year in prototype form, so it was excellent to hear the final version. They had been tweaked since we last heard them and were fast, detailed and a pleasure to listen to. 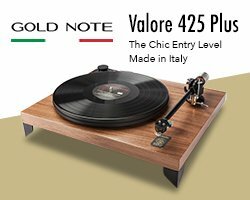 An unusual and attractive design paired with their sound is likely to make these a hit….expect to read a review from us soon. 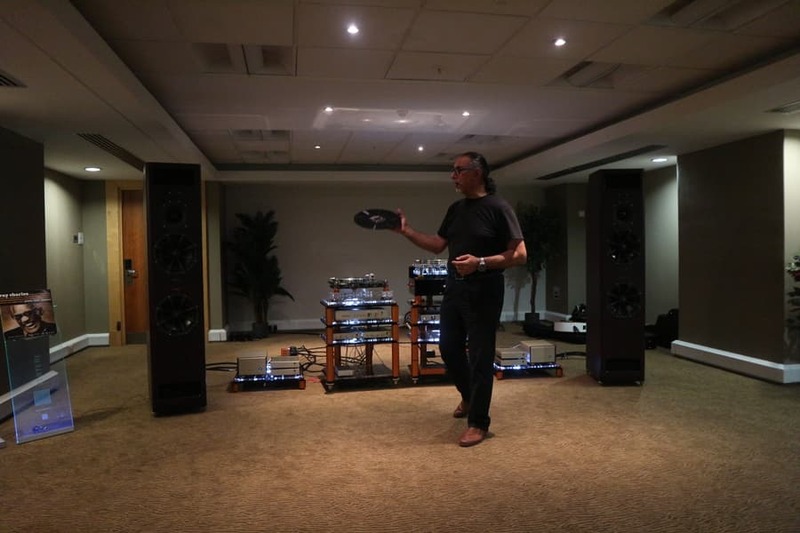 The Vertere room featured Touraj’s beautiful looking and sounding turntables, along with FM Acoustics and some huge PMC speakers, it sounded epic but you needed to get a bit of distance from the PMCs to get the best sound. Touraj Moghaddam is a well-known vinyl enthusiast who set up and was chief designer for Roksan Audio. His passion for music always shines through and he champions the Abbey Road Half Speed Mastering technique along with live music. We were treated to a stunning, emotional and beautiful performance from Dutch duo Elles and Marc. Their acoustic performance allowed Elles’s wonderful tone to shine through, one of the top highlights of the show for me. Bowers & Wilkins’ room sounded the best that I have heard the brand at a show. 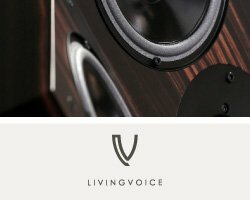 There was a whole lot of Chord gear and Chord Co cables partnered with their 802 loudspeakers in a limited prestige edition Santos Rosewood finish. The effect was simply stunning and went down well with the crowds, great to see and hear these British brands in partnership. So that was Festival of Sound 2018. The show has gone from strength to strength over the last few years and long may it continue! We are very much looking forwards to Festival of Sound 2019 and will bring you more details as soon as we have them! 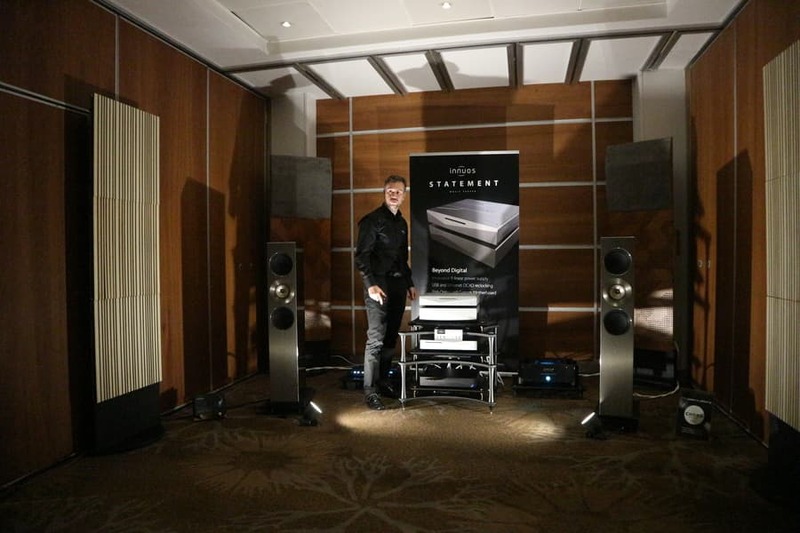 Read part one of the Festival Of Sound Show report, from Stuart, here and part 2 Here!